SMIGroup awarded with the "Prize of Prizes"
On the occasion of the National Day of Innovation, SMIGroup has been awarded by Giorgio Napolitano, President of the Italian Republic, with the "Prize of Prizes". By such prestigious award the government outlines the importance conferred on companies, as well as on private and public institutions, as major players in the innovation process, and joins their efforts towards the social, economic and scientific development of the country. 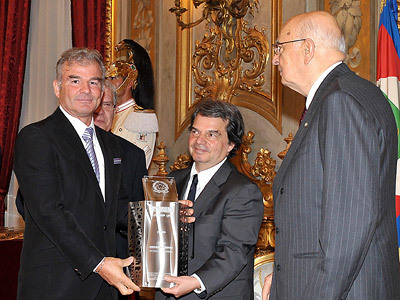 During the official ceremony held at Palazzo del Quirinale in the presence of the President of the Italian Republic, the parent company SMI, represented by Associate Director Arsenio Nava, was awarded for the results achieved thanks to constant investments in innovation. In fact, every year SMIGroup invests 4% of the company turnover in research and development, in line with a corporate philosophy based on state-of-the-art technology, high qualitative standards, eco-sensitivity, human resources development, synergy with the territory. All corporate divisions have managed to merge technology and culture, design and innovation, productivity and sociality: such blend of elements, together with a deep understanding of the customers' needs, have enabled SMIGroup to make headway in their field of technology and to stipulate long-term agreements with the main manufacturers of Food&Beverage industry. "For years SMIGroup has given top priority to research and development" declared SMI Associate Director Arsenio Nava. "Our company is adequately structured to meet the challenges the market will present to us. Being awarded this prize stands as an endorsement of a successful business strategy based on innovation." With 81,7 million Euro turnover in 2009 and 520 employees (of which 462 in Italy and 58 abroad), SMIGroup plays a key role in the economic scenario of Bergamo province and ranks among the world leading manufactures of packaging machinery. In spite of its calling for international trade (95% of the company production is exported to 130 countries), the group divisions are deep-rooted in Val Brembana territory, specifically in the towns of San Giovanni Bianco and San Pellegrino Terme (Bergamo), where production departments and offices spread over a total area of 65.600 square meters. For further information on the "Prize of Prizes", please visit COTEC (Foundation for Innovation technologies) website.